Wright Medical wants to make you aware that Medicare is significantly increasing inpatient hospital reimbursement for total ankle replacement (TAR) and revision of TAR procedures effective October 1, 2017. This 55% reimbursement increase – almost $7,000 – is intended to better align Medicare payment to hospital costs and ensure Medicare beneficiary access to these important ankle surgery procedures. Almost all TAR procedures (and revision of TAR procedures) track to MS-DRG 470, which has a fiscal year (FY) 2017 payment of $12,326.1 Wright on several occasions has submitted comments to the Centers for Medicare & Medicaid Services (CMS), presenting data showing that TAR procedures are more costly for hospitals than other types of joint replacement procedures. We have requested that CMS revise the MS-DRG / payment assignment for TAR procedures to more accurately compensate hospitals for the costs of performing these procedures. On August 14, 2017, CMS published its final rule to update the Medicare acute hospital inpatient prospective payment system (IPPS) for FY 2018. 2 As Wright recommended, CMS agreed to assign all TAR procedure cases3 to MS-DRG 469, even when there is no MCC reported. This results in a roughly 55% payment increase (almost $7,000) for TAR procedures compared to payment under MS-DRG 470 for FY 2018, which begins October 1, 2017. CMS also agreed to assign all revision of TAR procedures6 to MS-DRG 469, even if there is no MCC present, for FY 2018, with a payment rate of $19,296. 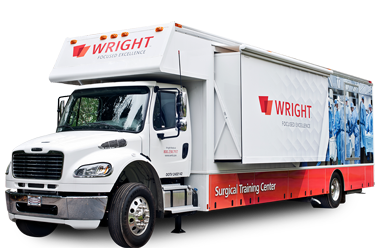 Wright is a focused, specialty orthopaedic company that provides extremity and biologic solutions that enable clinicians to alleviate pain and restore their patients’ lifestyles. We are a recognized leader of surgical solutions for the upper extremities (shoulder, elbow, wrist and hand), lower extremities (foot and ankle) and biologics (synthetic and tissue-based bone graft substitute materials) markets. Wright is committed to finding and delivering the best possible solutions to patients, providers, and Medicare. This information is presented for informational purposes only and is accurate as of its date of publication. It is the provider’s responsibility to report the codes that accurately describe the products and services furnished to individual patients. Providers should contact the appropriate payer if they have questions and follow the payer’s billing guidelines.